In the wake of the economic crisis in which Russia’s GDP fell by a stunning 7.9% in 2009, its status as a BRIC economy – with its connotations of promise and progress – was brought into question. After all, isn’t it a dying nation with rapidly degrading infrastructure? Isn’t it amazingly corrupt? Wouldn’t its contempt for liberal democratic values doom it to stagnation? And what happens now that oil production, the main locomotive of the Russia economy, has stalled thanks to the politicized persecution of “brilliant entrepreneurs” like Mikhail Khodorkovsky? Indeed, was not its economic collapse in 2009 a portent of things to come? And so on*. There are many reasons to dismiss these arguments, as I will try to show in this post. First, the very inventor of the BRICs concept, Jim O’Neill of Goldman Sachs (who has probably thought more about it than anyone else) dismisses the argument that Russia is ineligible on the basis that is was the only country amongst them to show (highly) negative growth during the economic crisis as “rubbish”. He goes on to add that “the only reason that Russia was hurt so badly was unlike the others, it borrowed heavily on the international capital markets and, of course, it is dependent on the price of oil.” ** Of course, the Russian economy’s dependence on Western intermediation for its credit is a structural weakness, and one that was exposed in late 2008. But potential faultlines like this are hardly unique amongst the BRICs – its most promising member, China, critically depends on exports for continued growth***, and its banks are saddled with bad debts. Second, many of these arguments from demography (“dying Russia”), infrastructure (“crumbling Russia”), and institutions (“Zaire with permafrost”) are both 1) exaggerated in severity and 2) exaggerated in their influence on economic development. Take Russia’s plummeting population… except that it hasn’t been plummeting or even falling since 2009! (It is now stagnant). True, Russia is going to see a substantial fall in its labor pool – according to the Rosstat medium scenario, from 62% of the total population now to a truly apocalyptic 55% by 2030****. (Yes, that was sarcasm). And though its population will age substantially in the next few decades, there probably won’t be any problems with paying pensions thanks to its resource wealth. Basically, Russia’s demography is neither as bad as it is usually portrayed in the Western media, nor will it negatively impact on its future economic development in any significant way. Now what about Russia’s crumbling infrastructure? Though Russia having no roads, only directions may be cliché*****, it does undoubtedly have an element of truth. But look at this from another perspective. Russia might have plenty of crumbling concrete and rusting iron carcasses, interspersed with the occasional modern highway or recently-built gleaming showpiece – but does it really, really need better infrastructure, or are its resources better spent elsewhere? 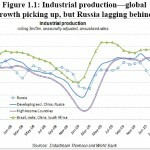 At least unlike India, or even Brazil or China, Russia has a complete industrial infrastructure. Its “Khrushchevki” prefabricated concrete tower blocs and disused railway stocks may give it a decrepit, even post-apocalyptic air, but the equivalent scene in India or China may well consist of a village of peasant huts with dirt paths meandering through it! In other words, Russia needs new infrastructure relatively less than the other BRICs (yet even so, Merrill Lynch predicted it would spend more in the next three years than either India or Brazil, despite its smaller population)! We revisit the debate over whether political institutions cause economic growth, or whether, alternatively, growth and human capital accumulation lead to institutional improvement. We find that most indicators of institutional quality used to establish the proposition that institutions cause growth are constructed to be conceptually unsuitable for that purpose. We also find that some of the instrumental variable techniques used in the literature are flawed. Basic OLS results, as well as a variety of additional evidence, suggest that a) human capital is a more basic source of growth than are the institutions, b) poor countries get out of poverty through good policies, often pursued by dictators, and c) subsequently improve their political institutions. Russia seems to fit the above model reasonably well. It has high human capital – far better than China or Brazil, let alone India. As I wrote earlier, “Around 70% of Russians go into higher education, compared with just 20-25% of Brazilians or Chinese… in the 2006 PISA science assessment, only 15.2% of Brazilians possessed skills beyond those needed for purely linear problem-solving, compared with 47.6% of Russian and 51.3% of American students”. Already resembling a developed country in human capital and having pursued reasonably effective economic policies under Putin, Russia may now slowly be moving towards surmounting that last institutional hurdle, with Medvedev now taking aim at the MVD (police) and bureaucracy. That said, Russia in the next decade will probably grow relatively fast nonetheless – not only because it is a well-educated nation with substantial room left for “catch up” growth to developed world levels, but because of a very favorable external environment. First, the (probable) peaking of oil production and China’s ravenous growth******* means that oil and resource prices will remain high, bringing in the hard currencies that would help Russia buttress its fiscal position and buy the technologies it needs to modernize itself from the West. Russia is enjoying a mirror image of the problems its more developed peers are facing up to. For example, the UK is one of the most indebted countries in Europe now after it borrowed a massive €257bn last year, ratcheting up its leverage to borrow about €2.80 for every €1 that the Bank of England is holding in its vaults as a reserve. The US is in similar dire straits. … Currently, Russian sovereign debt has a ‘BBB’ rating, which is only two notches above junk bond status. At the same time the US and UK have (so far) kept their ‘AAA’ ratings despite their worsening finances. Most economists are predicting Europe’s external debt to rise from 100% of GDP to 130% over the next five years, while that of Russia is expected to continue falling. Indeed, analysts say that the ratings of developed countries’ have disconnected with reality, while countries like Russia are being penalised. “On the basis of our model, the [best possible] ‘AAA’ rating for the US and the United Kingdom cannot be explained, as these two countries are rated two to three rating notches better than countries with comparable fundamental data,” Ingo Jungwirth, an analyst with Raiffeisen International, wrote in a study in March. His study found that based solely on the country’s finances, both the US and UK should be downgraded three notches to a ‘AA’. However, if the ratings agency actually went through with a downgrade, the cost of borrowing to both countries would spike and spark a financial global crisis, which would probably wreck the global economy for decades. Jungwirth suggests that these two countries earn a “bonus” for being too big to fail. The US, Japan, and most of Europe have reached their limits to growth. Now faced with unsustainable budget deficits, ballooning debts, and intense (BRIC-centered) competition for remaining high net energy resources, the long era of Western hegemony is now coming to an end. It is thus with some skepticism and bemusement that I view the smug commentary in the Western media on the Russian Foreign Ministry leak published at Russian Newsweek********, which they claim show Moscow’s “planning to reorient its foreign policy in a more pragmatic and pro-Western direction”, in apparent acknowledgement of its failed policies of dirigisme within and confrontation without. In reality, the Kremlin’s détente-for-modernization leak is more likely to be an Aesopian telegram that conveys Russia’s satisfaction with what it has already achieved and of the new world order that is emerging. In the past decade, the Russian state has consolidated and reestablished a sphere of “privileged interests” across Eurasia, decisively purging Ukraine and Central Asia of Western influence. Meanwhile, with the United States facing severe fiscal stress and geopolitical challenges on other fronts in the Middle East and the Far East, the West now has neither strength nor will to push back against Russia beyond Visegrad, and is beginning to lose its unity and cohesion. Russia’s security dilemma is retreating, as a new geopolitical equilibrium crystallizes along the marches between the West and Eurasia. Since good fences make good neighbors, this paves the way for better relations between Russia and some Western countries, in particular Germany, Italy, and France (in the Russian leak, Britain is conspicuous in its absence). Take the former. What interest does Germany really have in sending soldiers and paying taxes to perform a doomed “civilizing mission” in Afghanistan for the US, or in subsidizing Mediterranean profligacy while imposing stringent discipline on itself in return for their (aging and shrinking) markets? On the other hand, there is great potential for synergy between the German and Russian economies. The Teutonic industrialists have technologies and capital that Russia now needs to modernize its manufacturing and hi-tech industries, while the Russians have the energy and mineral resources that could keep German factories humming well into the age of scarcity industrialism. Back in October 2009, I suggested that this economic relation could be the basis for a new German-Russian alliance; now the New York Times has caught on. The American age of dominance is waning and will soon come to an end and a new constellation of Powers will take its place. Far from being a shunned BRIC in a world run by the West, Russia will be one of the main poles in the new world of the Rest. * See Nouriel Roubini, Anders Aslund or Julia Ioffe for the standard spiel. ** See “The R of the BRICs Remains Solid” part of this post. *** Of course there are arguments that the magnitude of these problems are overstated. **** The irony is that the more Russia’s (abnormally low) life expectancy and (now fairly average by European standards) fertility rates improve, the worse its dependency ratio will get in the decades ahead! Yet another demonstration of the stupidity of simple-minded extrapolation of population trends to future economic prospects. ***** In any case, in an age of peak oil, the wisdom of expanding road networks further is open to question. Russia would be better served by modernizing its railway system, on which it plans to spend 390bn $ by 2030. ****** On the basis that it fulfills democratic norms on paper although not in spirit, and in the sense that most Russians believe Russia is free and democratic (as was not the case during the Yeltsin period). Both the Polity IV political database and Economist Democracy Index perceive Russia as a kind of hybrid regime that is neither liberal democratic nor fully authoritarian. ******* This illustrates another important point – the BRICs are greater than the sum of their parts; they are more of an idea and a concept, than some kind of ranking in which countries can be kicked out of for (perceived) lack of performance. Strong Chinese and Indian growth, for example, help pull along nations like Russia or Brazil that are more heavily based in resource extraction. ******** See the full “О Программе эффективного использования на системной основе внешнеполитических факторов в целях долгосрочного развития Российской Федерации” here.